A good price for a round that is becoming more difficult to find in a premium version anymore. 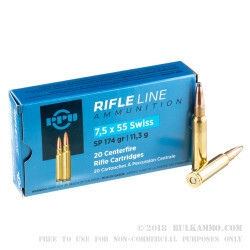 The 7.5x55mm Swiss by Prvi Partizan is a top quality new manufacture of the proven military round which had been firmly planted in the mil-surp ammo realm for many years. 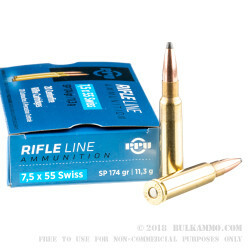 This is a great hunting choice for those that want to use their military rifle or have a sporterized version that can be used for deer season. 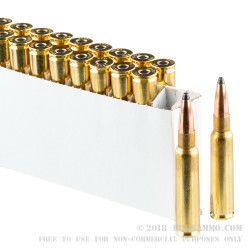 174 grain soft point is a large projectile that still achieves impressive ballistics like the 2500 feet per second velocity and the 2460 ft. lbs. of energy at the muzzle. The improved accuracy of this round is due to the improved specifications of the factory quality control and protocols. The powder charges are more consistent than military surplus round. The burn is cleaner than military surplus. 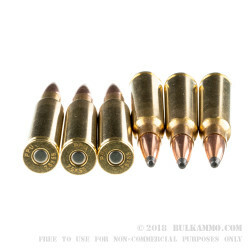 The Boxer primed brass is reloadable easily and the soft point projectile is suitable for use on animals at deer size and even a bit larger. The 150-250 yard range for hunting is very good considering the age of the cartridge design. Q: Is prvi partizan ammo corrosive? A: Hello Travis! Prvi Partizan ammunition is manufactured with all new components and is non-corrosive.